April 21st, 2011. Coaches across Continents has announced its third partner in Uganda with the Kampala School of Excellence Ministries. What is the aim of the KSEM program? Describe how you are using Soccer for Social Development. We offer training to youths and children from vulnerable backgrounds to enable them become useful persons in the community. Football is used as a tool for empowering youths to engage in constructive activities. Our elite programs targets helping the most talented individuals attain professional football qualities. More than 6 of our members have played professional football outside Uganda in Ghana, Cameroon, Congo(Brazzaville) and Rwanda. Another 27 are current members of the Uganda premier division playing for other clubs. Also we use sports to attract youths and children so as to pass on to them different messages especially as regards Health issues, Human rights and gender-based themes. We use soccer to create awareness on the current challenges affecting the community including HIV/AIDS, drug abuse and malaria prevention. By encouraging girls soccer through organising a girls clinic every after three months, we are helping to shatter the misconceptions relating to the involvement of women in sports. We do hope that empowering girls through soccer helps to advance community development. In this regard we partner with other civil society organisations to create awareness on reproductive health. We basically look into social inclusion, female empowerment, peace building and addressing health concerns. 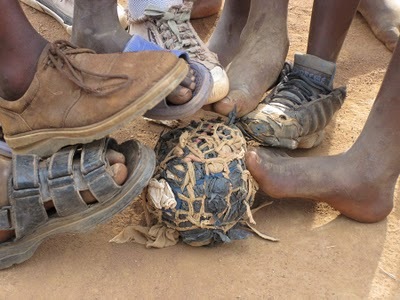 Tell us some of the things that you would do in a normal soccer for development session with the children? We involve each child is actively involved in these sessions, regardless of his or her level of skill. Every time we engage the children to play the game, they also learn health and social skills. We stop the play at periodic intervals to talk about important issues and at the end we always ask questions on what has been learned. “This is an organization that truly embraces the concept of sport for development and we are delighted to start a first year Hat-Trick Initiative to learn and share ideas and coaching styles. Moses has been working on the application process for more than 6 months and he has shown incredible dedication to the children in his community” Dr Andy Old, Coach Advisory Board. Coaches Brian and Sarah will run the program during the last week of July 2011. This is just great hope it yields the perfect fruit in the harvest season.